Disappointing lack of progress on EU and UK legislation fighting violence against women. 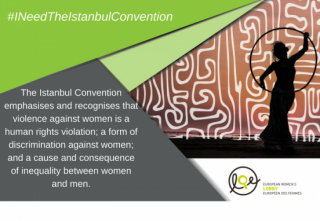 On 13 June 2018, the first anniversary of the signature of the Istanbul Convention by the European Union (EU), the European Coalition to End Violence against Women and Girls reported its regrets that strong progress towards the ratification was hindered by retrograde forces, and has called for the concluding of the process without further delay. Violence against women threatens the security of half of the population in the EU, affecting over 250 million women and girls. One in three women has experienced physical and/or sexual violence since the age of 15 and 96 per cent of EU citizens consider that violence against women is unacceptable; European citizens want action – and there is no more time to waste. The Council of Europe Convention on Preventing and Combatting Violence Against Women and Domestic Violence, also called the Istanbul Convention, is the first legally binding treaty in Europe that criminalises multiple forms of violence against women. It emphasises and recognises that violence against women is a human rights violation, a form of discrimination against women, and a cause and consequence of inequality between women and men. On 13 June 2017, the European Union signed the Istanbul Convention, sending a very strong political message on its commitment to end violence against women and girls. Yet by 13 June 2018, one year on, the EU has unfortunately made little progress with the ratification process. While the European Parliament adopted a strong resolution last September, the Council negotiations on the Code of Conduct remain ongoing, and, with a complex process to be undertaken in accession to the Convention, the need for immediate action has become critical. Therefore, the European Coalition to End Violence against Women and Girls urges the Austrian EU Presidency to stand up for women and advance the ratification process as swiftly as possible, to ensure that all women and girls in Europe can live their lives free from violence. The EU to appoint an EU coordinator on ending violence against women and girls, with a strong political mandate and responsibility to: coordinate the EU Strategy and all the efforts of the relevant EU Institutions and agencies (EIGE, FRA, EUROJUST, EASO, EUROSTAT, etc. ); and to facilitate the exchange of good practices for the implementation of the Convention at the national level. And the Coalition hopes that next year we will not celebrate another anniversary without the final EU ratification. The European Coalition to End Violence against Women and Girls is an extensive strategic alliance of more than 25 cross-European human rights and social justice civil society organisations working collectively to ensure that women and girls across Europe can live their lives free from all forms of violence. The UK signed this pan-European treaty in 2012, but had by the start of 2017 still not ratified it, meaning it was not legally binding in this country and the door was still open for governments to avoid implementing its measures. Then SNP MP Eilidh Whiteford tabled the Istanbul Convention Bill and its ratification went to a vote on Friday 24 February. Despite a 93-minute filibuster from Conservative MP Philip Davies claiming the bill was “sexist”, the bill passed with 138 votes in favour and 1 vote – from Davies – against it. It then received Royal Assent on 27 April and became law. Described by the UN as the “gold standard”, the ratification of this legislation marked an important step along the path to ending violence against women and girls. The bill focuses on a timetable that must be updated by all UK legislative bodies in their efforts to produce legislation that would “enable the United Kingdom to ratify the Istanbul Convention”. But the two-page Act provides no set time table and demands only yearly reports on the progress made by the legislative bodies. The first of these reports was published last November, and in its many pages, it claims that the UK in fact already complies with many of the aspects of the Convention. The government also published a statement on 25 November highlighting the UK’s leadership in the “global drive to tackle violence against girls and women”. The UK however, continues to be void of legislation clearly denouncing this type of violence. The issue of domestic violence appears to have made its way to the fore, particularly since the first report under the 2017 Act, thus demonstrating an element of awareness by public bodies and the government alike that the issue is far from resolved. It remains quite clear however, that whatever progress has been made, it has been made very slowly, and, as some sources suggest, is being inadequately implemented.